No contract. Just a handshake and a fistful of C-6 high explosives. Freelancer is probably getting a second look now that Wireless Net Pavilion has been out for a bit. But, is it worth including in a can-tag deck even if WNP, Fall Guy, or even Paparazzi is a rarity? I'd still say yes, and here's why—economy. Yes, economy, even if they're not using WNP and FG because playing this saves you a total of one and 4. 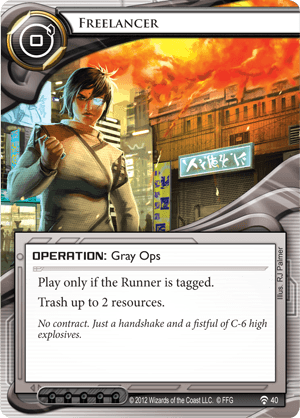 But if WNP and FG are the exception, Account Siphon is the norm, and that's where this card really comes into its own. On more than a few occasions, I've seen runners happily float a tag or two after draining the corp of all their , figuring, "At worst they'll for twice, and then trash 1 resource, but that's not the best use of s by itself." Not so if the corp has this, and the best part is, you really only need one. That's right, one play of this puts the fear of God into them for the rest of the game. While floating a tag against a broke corp seemed like a good idea, I'd wager any runner who sees this will definitely wait for that Lawyer Up to be in their hands before dropping another Account Siphon, and that can open up all sorts of opportunities for the corp. In particular, it can let you money up or open up a scoring window. So, is this going to see play? Maybe, but its popularity will be proportional to Fall Guy and Wireless Net Pavilion. Those running Account Siphon and floating the tags will wise up fairly quickly, but then it has arguably its done its job without even being played. Still, I like to pack one copy in any of my tagging decks, right alongside Cyberdex Virus Suite.